We are Eventions Event Designs, and we're so glad you decided to check out our site! We have newly acquired gold, silver, black, and white chiavari chair rentals in the Washington DC, Maryland, and Northern Virginia areas. Renting new chiavari chairs from our company means uncompromised quality, and chairs that are void of chips, imperfections, and paint wear. Chiavari chairs are the epitome of elegance and grace and compliment every venue perfectly. Its light and delicate stature coordinates with all event design styles from traditional, steampunk, and medieval to vintage, shabby chic, and Hollywood glam. In the past, the function of the steel-framed brown and green tweed upholstered banquet chair served its purpose and no one noticed them. Now, many banquet facilities and venues are stacking their banquet chairs in exchange for the highly desirable chiavari chairs. Over the years, they are proving to be essential to an event’s décor portfolio and no longer a second thought when planning an event. We offer ivory or black cushions in the rental fee. Our rental selection also includes seat covers, chair caps and jackets, and custom chair covers in many color choices and patterns to coordinate with our table linens. We also have chair embellishments such as brooches, flowers, and crystals. 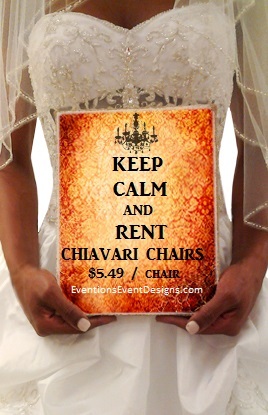 Check out our blog or Facebook for our rental selection and package specials for chiavari chairs, table linen, dance floors, lounge furniture, and more! We know you have a choice of suppliers and as such, we welcome the opportunity to earn your business by delivering the highest quality chair rentals. You can be assured that all of our chiavari chairs will be in pristine condition, identical in shape (manufactured by the same factory), and the seat pads all being clean and in great condition. Our service is aimed at being perfect in both timing and manner. Delivery fee varies based on location. We extend this service with no additional cost for delivery and pickup on Saturdays and Sundays.